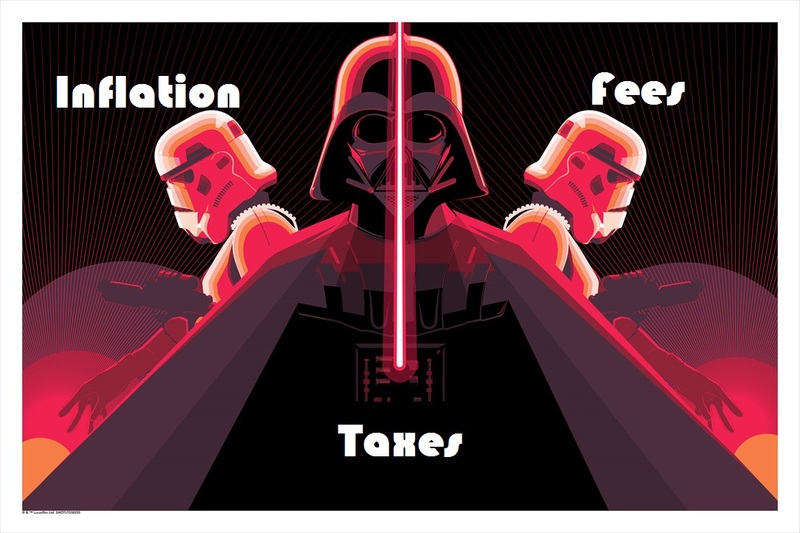 Fees are one of the Unavoidable Trifecta of Investment Costs (UTIC), taxes and inflation being the other 2. 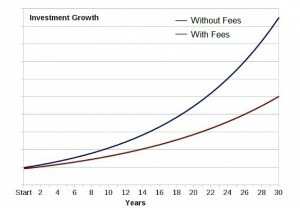 Fees are unavoidable because you really can’t even save your money, let alone grow it, without the services fees yield. Without banks, for example, you would have to store your paper money in a physical location in your house, which suddenly becomes vulnerable to fire, theft, and other bad things. 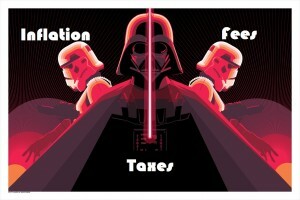 Bank fees / credit card fees – It is really hard to function in our economy without a bank account. In addition to the physical protection and government insurance that blanket your money, banks provide loans to people who would otherwise not be able to launch their business idea, or buy their first house. Banks have many annoying fees (ATM fees, having a savings account with little money in it), but provide a lot of services that make buying things easier and safer. Certainly a necessary cost. Stock trade fees – As reviewed in my post about actually buying stocks, you will need a web broker that will execute your order. These typically cost from limited-time-free to $10 per trade. That means if you want to invest a bit of your money every month into the S&P 500, you might have to pay as much as $120 a year in web broker fees buying new shares. Fund management fees – Every fund has a management fee that is charged to investors like us to pay for the management of the fund. This fee can include everything, include marketing and legal costs for the company that runs the fund. 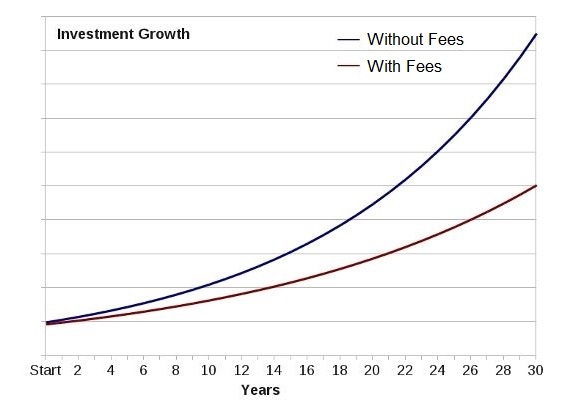 Generally, if the fund is human managed, you can expect fees of up to 1% – 2%. 1% – 2% may not sound like a lot, but it adds up to a lot over time. To illustrate, I’ve put together a spreadsheet in Google Docs that has a table with a breakdown in money invested, investment growth, and fees. You can’t edit it from your web browser, but if you go to the top right and click File -> Download as, you can download the spreadsheet as your own .xlsx to play around with. The spreadsheet can be found here, in it you’ll clearly see how investing $200,000 over 20 years will result in a total take-home (before taxes) of $409,000 after $53,000 in a typical fund’s management fees are applied. If you play around with the spreadsheet, you’ll find that the more money you have invested, the more scary your fees will be. Index funds, like Vanguards S&P 500, also have fees, but because index funds are run by a fairly straight forward computer program, humans generally aren’t involved. That makes index funds comparatively inexpensive, Vanguards S&P 500 has a Management Expense Ratio of 0.13%. Not everyone has a financial adviser, most don’t. But those who do will need to pay for them. Lots of large financial institutions will typically pay their financial advisers commission. Your financial adviser will probably take a fraction of that 1-2% fund management fee, or they might take a cut of any mortgage or other financial service they are providing you. I personally don’t like this payment model, it is one of the reasons why I decided to manage my finances myself. The problem is that obfuscating how your financial adviser is paid will hide the fact that they are paid (and thus, motivated) more for selling you more profitable services, like insurance. And obviously, a financial adviser working and ABC Bank will only be able to help you with funds and services that ABC Bank provides, meaning you’re only getting the best products and services from ABC Bank, not the best products and services available. So, because of inflation, we know that we can’t just leave our money in a regular savings account. Your money does grow slightly in a typical savings account, usually by less than 1%, which is barely better than nothing, but still better than nothing. Why do banks give you any interest on your saved money at all? It’s because they want you to put your money with them. Banks don’t just sit on your money and keep it safe, they invest it in their various business endeavors (typically mortgages and other types of loans) and take whatever return on investment (ROI) for themselves, which will be much higher than 1%. So it’s in their best interest to have people save money with them so that they can invest it into something that offers them a better return than 1%. Banks are required to keep a certain amount of cash on-hand, but given that most people keep their savings with their banks and rarely make significant withdraws, they don’t need all your cash on-hand as only a very small percentage of deposits are withdrawn on a regular day. Of course, if times get tough and trust in banks or the economy plummets, people will want their money in their hands and withdraw their savings at the same time as everyone else. That creates a major problem, as Greece experienced with their recent election, where the banks simply didn’t have enough money to give to people. But don’t worry, in Canada, if such a thing were to happen, the Canadian Deposit Insurance Corporation (CDIC) will cover you up to $100k per account with tax payer’s money (though I’m not sure how that would work if the Canadian government was out of money too). As you can see, it’s pretty tough to get much more than 1% interest on your savings at any bank or financial institution. To make it more difficult, the range in savings rates depends on how much you invest, CIBC gives you no interest for any savings that total less than $5000. 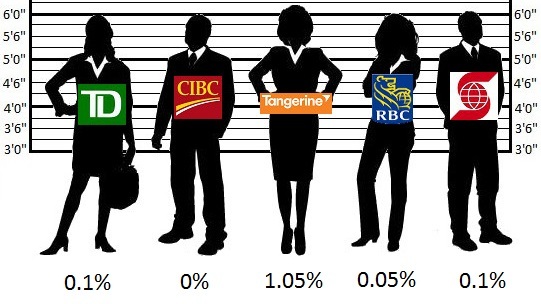 To get a savings growth rate of 0.2% at RBC, you need $25,000 deposited with them. I have mentioned how inflation makes everything cost more every year. Over the last 15 years, the average annual inflation rate has been 1.97% per year, which is significantly higher than any of the interest rates any bank will give you to grow your money. This means that even if you had money in any of these bank’s savings accounts, your money would still lose about 1% to 2% of its value every year. What this boils down to is that in Canada, you effectively lose money every year when it’s in any savings account. Banks still want you to invest with them though, they regularly offer incentives to lure your money into their accounts, usually with a limited time ‘high’ rate of return, currently between 2.5% and 3%. But buyer beware, those rates only last for a few weeks, then you are back on the regular low rates. So what’s the solution? How does one protect the value of their money? Let me answer with another question: How do rich people grow their savings? You remember when you were a kid and a chocolate bar cost far less than it does today? This phenomenon happens because of inflation, and the same thing that happens to chocolate bars happens to your money too. I don’t see inflation talked about as much as I think it should be, especially when it comes to personal finance. This blows my mind because every year all money, including yours, loses a bit of value to inflation. In fact, since 1993 the Bank of Canada has been openly committed to an inflation target of 1-3%, meaning a little inflation is good for the economy in general, just not your savings. Inflation is a big, complicated, abstract concept which is why I think it is so often overlooked. But after looking at various ‘high interest rate’ savings accounts, I started to think that people not familiar with inflation are losing money when they think they’re gaining money. You are king/queen of a small village of 100 people. To avoid everyone bartering, you decide to create a currency based on gold, you have one kilogram of gold and you decide to create coins for your 100 subjects. So you take your gold and make 200 royal coins. Your people are happy, they now have something that allows them to price their goods and services more accurately than if they were trading for other goods and services. Your plan works well. The villagers find it easier to buy and sell goods, and thus easier to make money. But you only have 200 coins, and your inventive villagers start coming up with new ways to make money, new goods and services to sell and you soon notice a coin shortage in your economy. Your more successful inhabitants are saving coins from their successful business endeavors, taking fewer and fewer coins out of general circulation. You discover that of the 200 coins you made, only 100 seem to be exchanging hands regularly, making the coins more scarce, and thus more valuable to the point where one coin can buy a villager enough grain to feed a mule for a whole year. So you decide to buy another kilogram of gold (perhaps by introducing taxes) and mint another 200 coins, doubling the amount of coins in your economy. Because so many more coins are now in general circulation, they are no longer scarce and one coin will now only buy a villager enough grain to feed a mule for only half a year. Those who saved coins before you introduced more coins would find that their savings have effectively been halved because they can now only buy half the goods for the money they had saved. By doubling the amount of coins available, you’ve effectively halved the monetary value of all your coins. Inflation went up 100%! The Canadian economy works on the same principle, except it isn’t based on gold and is more sophisticated. In addition to introducing new money into an economy, rising costs in manufacturing or a commodity scarcity are also big factors in inflation. The Bank of Canada is the institution that manages the Canadian Dollar; it issues new money and sets the interest rates. It also has a target inflation rate of 1-3% that it uses to steer the economy. 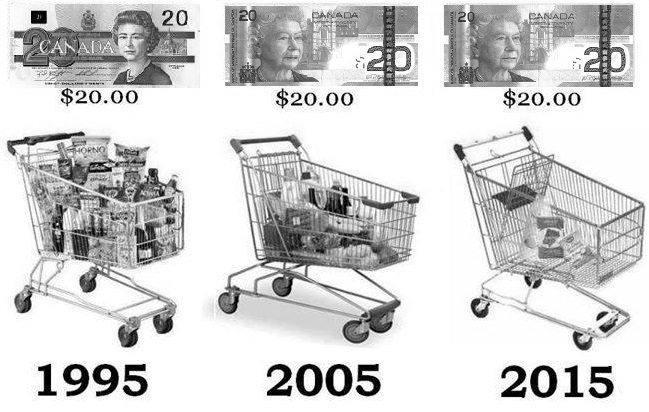 The Bank of Canada measures inflation by measuring the change in the Consumer Price Index, which is a “basket” of thousands of consumer goods (for example: a kilogram of Royal Gala Apples, a new Toyota Camry, a pair of Levis 501s, etc.) and tracks the price changes. In fact, the Bank of Canada has a handy inflation calculator that lets you see exactly what inflation has been. Using this calculator, I can see that in 2014, inflation was at 0.97%. In 2013 inflation was 1.48%. Since 2000, inflation has gone up 32.94% with an average annual inflation rate of 1.92%. Looking at the inflation calculator, I see that $100 in 2000 would get me the same amount of goods then as $132.94 in 2015. Put another way, a chocolate bar that cost $1 in 2000 would cost you $1.33 in 2015. Inflation means each year $1 will buy you less, so if you have money just sitting in a bank account collecting little or no interest, you aren’t losing money, but as the cost of goods grows, the value of your money does not, and you will be able to afford less things as the years go on with the same amount of money. To use another example, if $11,000 was a median annual salary in 1950, and I worked for a year and managed to bank my entire salary (somehow avoiding taxes and the cost of living), I would have $11,000 in the bank today. Which won’t get me nearly as much as if I had today’s median annual salary of $45,000 in the bank. If you have $1000 in the bank today, what do you think you’ll be able to buy with it in another fifteen years? Next week, I’m going to look at various savings accounts and see how those “high interest” rates stand when you apply inflation.